Our goal was to score by shooting balls into the high goal. 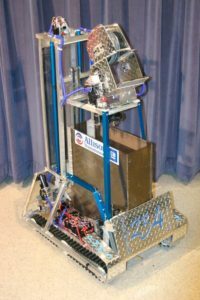 To accomplish this, we designed and built a robot that could pick up balls from the floor, move them up into a conveyor, and then drop them into a shooter that would fire the balls into the goal. Also, in order to climb the ramp and to hold its position, Falcon VIII was equipped with the same treads that we used in 2004 to climb the step. One strength of this robot was its 2-speed transmissions in combination with the treads. The treads allowed to easily climb the ramp and hold our position as other teams tried to play defense on us. 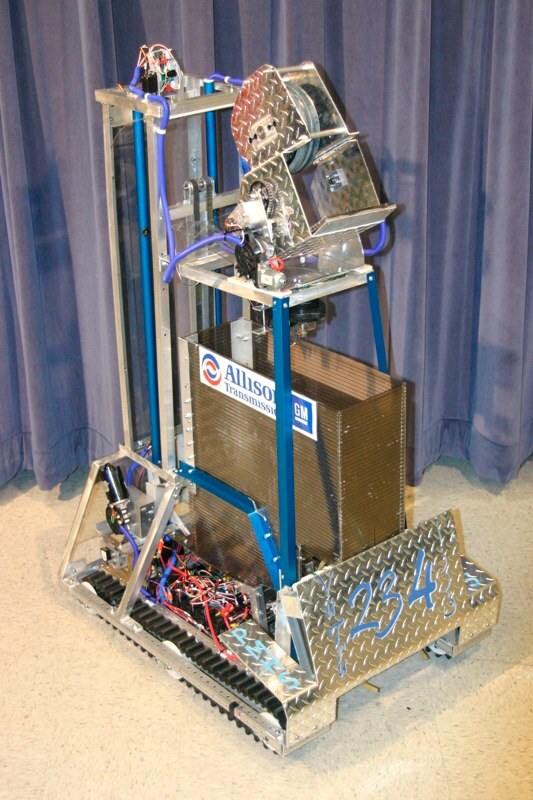 The 2-speed transmission allowed us to fly around the field when we need to pick up balls in high gear and to climb the platform and push people around in low gear. A feature that we were very proud of was that the shooter was on a turret that could both pan and tilt. The best part about this was that the movement of the pan and tilt was controlled by the camera mounted on the top of the robot. This camera searched the field until it found the light above the high goal. Once locked on, the shooter aligned itself with the camera and was targeted on the goal.